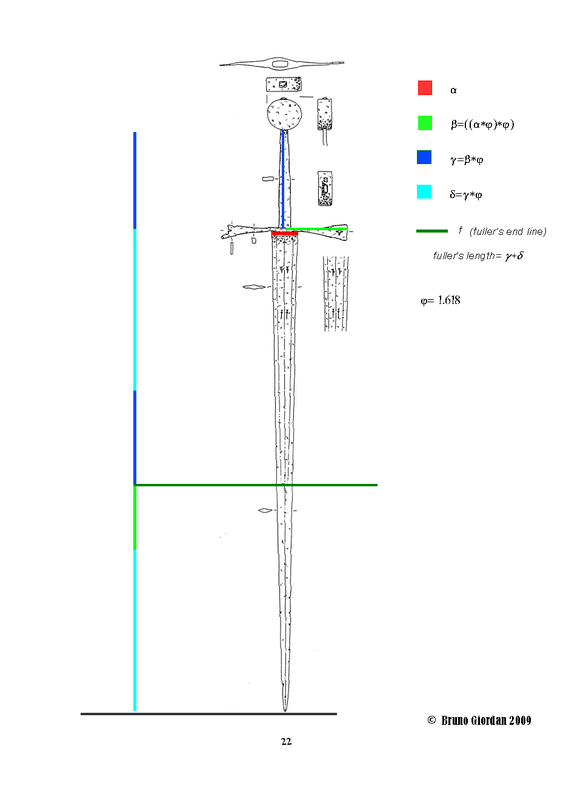 Peter could explain it better than I, but suffice to say that not only the hilt to blade length is based on the Golden Section, but the distribution of mass from pommel to blade and throughout the blade is all according to the Golden Section. Mikko hit it on the head in his comment above, as did Thomas -- this was believed to be one of the great secrets in art and architecture, the harmonius proportions found in nature. Based on the stats of the Svante on the Albion site, the hilt to blade ratio is 1:2.58 and the blade to overall-length ratio is 1:1.388. Neither of these is the golden ratio (1:1.618033....). On a line AB, point C is positioned such that the ratio of the short section (CB) to the long section (AC) of AB is equal to the ratio of the long section (AC) to the whole (AB) - and hence the derivation of Phi. Now look at these lengths as radii of circles - apart from anything else, can anyone see the beginnings of the cross-section of a hollow-ground blade in here...? I'm also agog to hear what the bladesmiths have to say about this - the golden section is seen in SO many things and has been around as a mathematical and aesthetic concept for thousands of years. I'd LOVE to know how it was applied to swords in the past! This just occurred to me too - if you add the original length AB in again to your overall length and then look at sword dimensions you get something that looks like this, which seems much more in proportion - AND you now have TWO Golden sections! I'd love to know how (or if!) this would work in practice! Actually, it is pretty much the ratio (phi) which constitutes the "golden" part. Your explanations is pretty much right but should still lead to the same ratio. How you apply it is a different story. Look back at some of the links provided, especially this one. There is much neat stuff there. Well, let's do some simple multiplication: let's say that the length of the hilt assembly (CB) is 6.25" (fairly typical for a single-handed sword). Multiply that by Phi to get the length of AC, which would be 10.1". Multiply this by Phi again to get 16.34" for AB. What we end up with is a single-handed sword with a 26.4" blade (AB+AC) and a 6.25" hilt, with an overall length of 32.69". That's pretty darn close to many single-handers. My Windlass Drac, for example, is (rounded for convenience): hilt=6.25", blade=27.5, and overall=34". You may be onto something here. D'oh! I tried the same calculation on the Albion Spadona, and the numbers are way off. Well, back to the old drawing board. True - but I bet if you reversed the positions of AC and CB so that AC became the hilt length and CB became the extra blade length you'd get something very close to the Brescia or the Svante! Alexi, I agree absolutely - it always leads you back to Phi! I was indeed thinking more of how you can use it and apply and manipulate the ratio than the absolute numbers themselves! 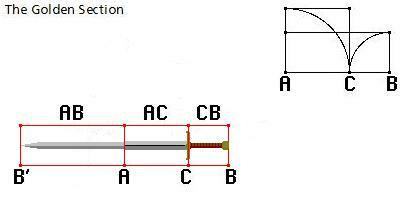 The application of golden section in sword design has been a focus of my study some three or four years now. Before I began making swords fulltime, I was working as graphical designer and Illustrator. In my art training an important tool was the use of harmonic proportions in layouts and compositions. This is a very old art that bridges most of historys civilizations. Medieval art and engineering is very much built on the application of harmonic proportions. The principle of the Golden section is one of them, and perhaps the most prominent and important, but there are other series of proportions building on other rations that are equally workable, for example number series derived from the square root of 2, 3, 4, or 5. One must understand that these principles does not automatically result in efficient or pleasing designs. There is a science or art in their application as well. Book design/typography is very much dependent on an understanding of these principles. The same goes for architecture or fine art for that matter(at least in a medieval perspective). This thread have gradually gotten closer to how this is actually done. You work with decreasing divisions of a given number (It could be blade length or any other length that makes sense) With this series of numbers you can construct the proportions of the blade and hilt. You can even build the degrees of distal taper, shape of cross section, relation of mass of different parts, change in angles or what ever you need to designate. How far you want to take this is up to you and what makes sense in any given situation. So how much of this is there to see in historical material (=surviving medieval swords). First we must understand that swords were not forged by a smith using a pocket calculator. What proportions or measurements he used were derived from the measuring tools of a smithy: a compass, a measuring stick and a plate cut with notches to see thickness. The Golden section need not be calculated by decimal exactness. IT can be implemented using fractions. the series of numbers 1, 1, 2, 3, 5, 8, 13, 21, 34, 55...is the Fibonacci series of numbers. Fibonacci was a 12th C mathematician who among other things found this principle for growth, where each new number is the sum of the two previous ones. If you construct fractions of this 2/3, 3/5, 5/8 and so forth you get a result that comes ever closer to 1.618....or Phi. You may design a book that has a page with the proportions 8:5 and it will follow the golden section, even if it is not exact if measured and divided to read the decimal relationship. You can also divide any given length in, say eight parts or five or thirteen, and get a module measure by wich you can construct any given object, for example a sword. You can then use this module in various scales or construct sub divisions. In short there are unlimited ways to apply these principles. How you do this is where the knowledge and art is. To learn how this was done we need to study originals. To my knowledge this has not been done on swords. That is why I work along this hypothesis and look for harmonic proportions in swords of various time periods. These principles are a great help in understanding the "logic" of medieval designs. It is often the more or less hidden structure that is beneath the obvious. Thanks Peter, that all makes great sense - the great mystery of where and how to blend science and art...! You have very much encapsulated what I was heading towards with my earlier comments - but you have done so much more effectively and eloquently! I have often wondered how much is training, study and calculation and how much derives from an individual craftsman's "flair" and "feel" for his subject. My suspicion (and, yes, it does sound like I'm hedging my bets here) is that it will vary greatly between individuals - some will tend towards a very technical approach where the biggest part is done "by the numbers", others with simply have a natural talent and intuitive understanding and by using these will come very close to numerical "perfection" but from a totally different route and then there will be those who blend an equal understanding of both the learned and the intuitive - either way, all these groups of artisans will still produce outstanding and astounding work! I'm curious - have you begun to identify any trends in sword-making that suggest that there was indeed a deliberate use of ancient geometry in the construction of historical weapons (as against a "chance" use of such principles because that was just what was found empirically to work best) ? The use of the Golden Section, the Fibonacci series and the other ratios you mention seemed to be very important to a number of different cultures and societies so I wouldn't be at all surprised if there's something in this. Thanks again for your coments. It seems that you made a very nice presentation about it at the last Lanze Fest. Is there any chance, that you could repeat this online? On the Golden Section and its use in design and engineering can be written volumes. It is difficult to address this in a good way in short post. One alwys runs the risk of creating new "truths" that are actually just one aspect or version of what is possible. I am still working with this hypothesis. There certainly are trends in how this is applied in swords, but I feel reluctant to go into too much detail at this stage. I have hopes to publish these ideas with thorough ilustrations and examples: it is not a very good idea to present the work while it is still only halfway done. I do not intend to hide this under a blanket, but I would like to have opportunity to make a full presentation in due time. The presentation I did during the "Swordfest" at Albion was using the sword of Svante Nilsson as example. It was actually this sword that put me on the track of finding ways to analyze swords in the aspect of the Golden Section. One day some years ago I was trying to find a way to implement harmonic proportions in sword design just as it it used in typography and sat scribbling witth a pencil in a sketch book. To start with I drew a line on a peice of paper to represent the length of the blade. I divided this in eight parts resutling in a module to be used as a "building block"(8 being a number in the fibonacci series). I then could use 1, 2, 3, and 5 to multiply the module with as all these belong to the Fibonacci series. This is a rather basic way to use the tool but I wanted to keep it simple to begin with. I tried to have the hilt 3 times the module and the guard two times the module. I double checked the measurement of the sword as I had noted them and found a high degree of correspondence. The deifference was less than a milimeter in many cases and well within acceptable variation given that the sword was not made with a precision caliper or pocket calculator at hand. Going further I found interesting correspondances in how the distal taper varied along the blade and how these sections of the blade related to each other. Next I started to look through other swords I had documented and saw that you could see harmonic proportions being applied in many aspects. Especially in how blade width , thickness and distal taper varied rythmically in different swords, but also in over all proportions of hilt components and outline of the blade. Interestingly it seems that the use of harmonic proportions in the shaping of a blade will have effects in the placing of nodes, pivot points and resonance. This has a direct effect on performance and handling. Harmonic proportions therefore seem to have an effect not only on the aesthetic aspects of a sword, but also its performance. It is to be likened with how many musical insteuments are built according to harmonic proportions, to make the most of their accoustic potential. In the case of swords the desired effect is the opposite: you want to minimize the influence of vibrations. I hope this short text will give you an idea of the scope of this topic: Harmonic proportions can influence many different aspects of the sword and can also be a tool in our understanding of their functional principles. To make a more thorough presentation of this I would have to write a much longer text and provide illustrations and examples from historical swords. This will have to wait till a possible future publication. So how much of this was ancient swordsmiths aware of? It would have varied of course. You need not have theoretical schooling in these matters to be able to do work that express harmonic propotions. It only takes a good eye and a developed understanding of form. I would not be surpriced if cutlers in urban areas who socialized with masons, artisans or artists of various kinds knew about and discussed these ideas. It is not unreasonable to assume cutlers defined some aspects of the blades they ordered from blade smiths. Likewise, I think that blade smiths through history (a few or many?) would have developed a theoretical understanding of proportions. It is reasonable to work according to rules of thumb and well defined processes when producing volumes of blades to set standards. Before the blade is shaped the billet is drawn out to a bar of specific taper and cross setction. This is then given the correct crosss section and possibly a fuller. The proto blank need to have the correct distribution of mass for the final blade to have the correct balance. If many blades are forged in a series, which would have been normal, then it makes good sense to designate the proportions of the proto-blank. Those proportions would carry through in the finished blade even after grinding. This is actually an important aspect in my design work for Albion: My blade designs are much like the forged blank that the blade smith would have sent to the grinder. That semi finished blade need to have the right proportions or the sword willl not have the correct heft or perfomance. Harmonic proportions is a design tool that is of great help in acheiving swords that have the same heft and feel as their historical counterparts. Fantastically put. I fully understand that if there's a possible publication in here somewhere (which it rather sounds like there might be!) then it would be inappropriate to say too much more while your research is still on-going. It sounds like it will be a fascinating read when it's finished though - I look forward to seeing the completed article...! Now I get it. Combining your written response and the pictures form your presentation I get a clear picture of what is being discussed. And I did quick measurements of certain aspects of my some of my swords, and I am finding these correlations to the Fibonacci series. I think it is worthwhile resurrecting this td, as I have made a little diagram of the golden section correlations that i have found in the recently discussed Ljublianitza swords. I have made such observations at different enlargements of the diagram gently provided by Blaz Berlec, and the results appeared quite consistent to me. The base module was the blade width at cross (alpha). The rest has been calculated using 1.618 as phi. Very interesting! Blade width, grip length and cross width are here really simple derivations of one another using the golden section. I can't even remember of any such clear case of using golden section from architecture! I'm quite sure there is something in that! As I can remember from seeing some reconstructions of Gothic architectural design, these kind of "calculations" were done with very simple tools - compasses and such, not complicated decimal calculus. Although I have no idea how I would even start, I don't know a lot about geometry. But it would be certainly interesting if we could "backtrace" the design process of such a sword. If not for anything else, it would make a great design for backdrop or wall poster.